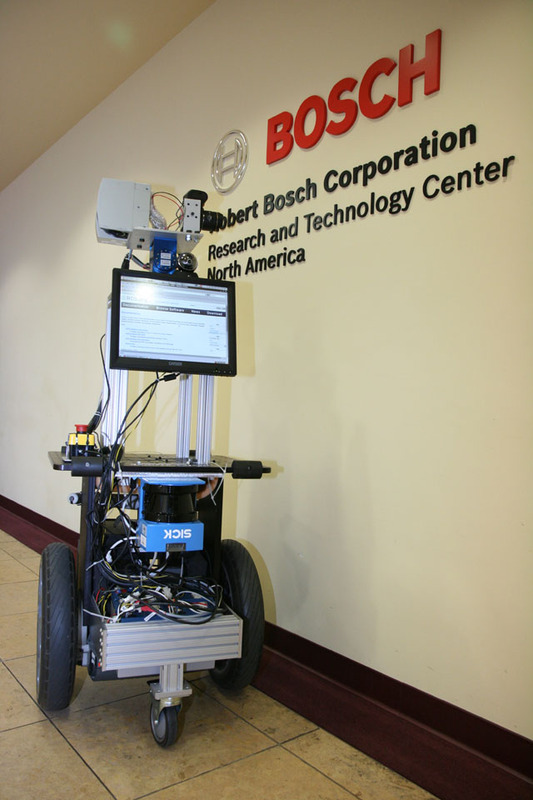 Bosch's Research and Technology Center (RTC) has a Segway-RMP based robot that they have been using with ROS for the past year to do exploration, 3D mapping, and telepresence research. They recently released version 0.1 of their exploration stack in the bosch-ros-pkg repository, which integrates with the ROS navigation stack to provide 2D-exploration capabilities. You can use the bosch_demos stack to try this capability in simulation. Like most research robots, it's frequently reconfigured: they added an additional Mac mini, Flea camera, and Videre stereo camera for some recent work with visual localization. Bosch RTC has been releasing drivers and libraries in the bosch-ros-pkg repository. They will be presenting their approach for mapping and texture reconstruction at ICRA 2010 and hope to release the code for that as well. This approach constructs a 3D environment using the laser data, fits a surface to the resulting model, and then maps camera data onto the surfaces. Researchers at Bosch RTC were early contributors to ROS, which is remarkable as bosch-ros-pkg is the first time Bosch has ever contributed to an open source project. They have also been involved with the ros-pkg repository to improve the SLAM capabilities that are included with ROS Box Turtle, and they have been providing improvements to a visual odometry library that is currently in the works. This page contains a single entry by kwc published on March 18, 2010 8:04 AM. ROS 1.1 Released (Unstable) was the previous entry in this blog. ROS 1.1.1 Released is the next entry in this blog.